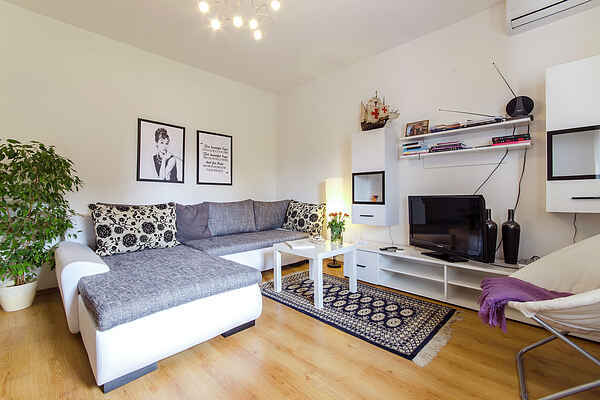 Apartment Nada is located in a quiet residential area of a popular tourist town of Rovinj. Comfortable first floor apartment features a nice living/dining room with balcony, bedroom suitable for 3 persons, open kitchen and a modern bathroom. It can accomodate up to 5 people. Grocery store and restaurant are only 100 meters away from your apartment. Charming old town of Rovinj is 1.5 kilometers far. There you can enjoy the mediterranian atmosphere by walking through little narrow streets or tasting local dishes in charming tavernes. Numerous Rovinj beaches are awarded with the Blue flag, symbol of a clean and well-attended beaches. Only 15 minutes walk from the town center there is Golden Cape - Park forest, inevitable destination for nature lovers. The Rovinj archipelago is formed by twenty islands easily accessible by local ferries. The ancient town of Pula and National park Brijuni islands are only 30 kilometers away. Rovinj is an ideal starting point for exploring peninsula of Istria. Also, there are excursions to the world known town of Venice. The coast is various and many different types of beaches are nearby. There is more than one Rovinj beach awarded with the Blue Flag, the symbol of a clean and well-attended beach. There are also organized boat trips and excursions as well as short ferry rides to nearby islands. Several bike trails that are more than 25 km long are easily accessible from the apartment. One of the most popular is situated in the wonderful Golden Cape (Zlatni rt) Park Forest - Punta corrente – a protected Forest Park of singular beauty and of high aesthetic and botanic value, one of the most important parks on our coast. Alongside the forest you can stop and take a swim in one of the magnificent bays with nice pebbles. The picturesque town centre is a 10 minute walk from the apartment and offers historical and cultural sites as well as a true autochthonous experience of traditional meals with great istrian wines. Rovinj's restaurants will impress you with their selection of creative dishes with fresh fish, crabs and shellfish, Istrian's cured ham, truffles or wild asparagus. While tasting traditional meals you can enjoy a glass of traditional Istrian white wine - Malvazija (Malmsey) or red wines such as Teran, Merlot and Cabarnet Sauvignon.